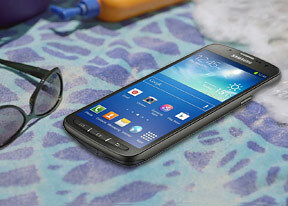 The Samsung Galaxy S4 Active has the exact same set of controls as the regular S4, with the only differences mandated by the water-proof design. The three controls below the screen are hardware buttons which, as we already mentioned, are more reliable than capacitive when water is involved. They, along with the Power/Lock key and the volume rocker, have a fine texture, similar to the back pattern, to improve grip. The key arrangement is still Menu, Home, Back, even though Android retired the Menu key and moved its functionality on-screen. This is still what you get on every Samsung, so we didn't expect anything to change here. Above the screen are the standard proximity and light sensors, but also the exclusive IR motion detector, which is used for Air Gestures (waving your hand above the phone to scroll pages, change music tracks, accept a call and so on). While we're not big fans of this feature, we can see how it makes sense here - it lets you control the Galaxy S4 Active without touching it with mud-covered hands. The RGB notification LED is also here, along with the front-facing camera. The left and right sides of the phone feature the volume rocker and Power/Lock key respectively. The volume rocker can be set to work as a still or video shutter key, which is yet another thing that might come in handy in or around water (again, capacitive screens and buttons don't work when wet). It cannot quite replace an actual shutter key, but it's the next best thing. The volume rocker can also be used to activate the LED torch, even when the screen is off. Just make sure you enable this option from the settings. You can also set up an auto-off time so it doesn't drain your battery if you forget it. The volume rocker is easy to locate by touch and this will work even if the touchscreen doesn't (i.e. when it's wet). The microUSB / MHL 2.0 port is at the bottom of the phone and it is sealed with a plastic flap. Right next to it is the mic pinhole. Up top, there's the 3.5mm audio jack which is left exposed. There's a "WATERPROOF" label etched into the plastic if you need extra reassurance. Most water-resistant phones put a flap on the audio jack too, meaning you have to open it every time you want to plug in your headphones (and then remember to close it). The secondary mic and the IR emitter are also here, the emitter is used for remote control functionality in the comfort of your own home. The back of the phone packs the 8MP camera lens and the LED flash. There's no extra protection offered for the camera, which protrudes slightly, so you should take care not to damage it. Under the removable back cover are the 2,600mAh battery, microSIM and microSD card slots. When detached, the back cover doesn't feel particularly solid and has a hollow knock to it. That's not an issue when it's mounted on the smartphone, though. Overall, the Samsung Galaxy S4 Active is like those city slicker four-by-fours - it can go off-road, but prefers paved streets. We don't think it will take too hard knocks and walk away with it, but water shouldn't be a problem. Not that the Sony Xperia Z is much tougher - if nothing else the glass-covered rear means one more panel to scratch or crack. We ran our battery tests on the Samsung Galaxy S4 Active, expecting it to perform similarly to the I9505 Galaxy S4 (same chipset and battery, different screen). In the end the LCD drew noticeably more power during video playback and with a slightly lower talk time, the S4 Active scored an endurance rating of 57 hours. That's not as good as the 69 hours of the regular S4, but it's still a very good result - go to our blog for more details. 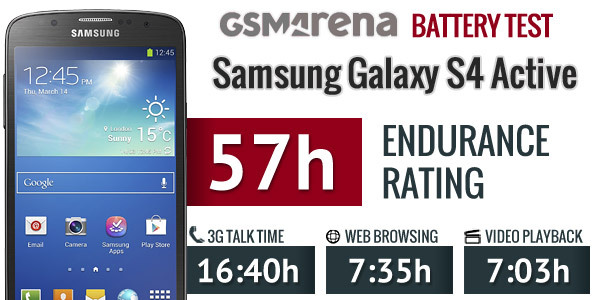 You can find the detailed breakdown of the Samsung Galaxy S4 Active battery test in our blog.